I don’t mind free-to-play games, inherently. What I do mind are games whose monetization schemes are tilted against the player to the point that they severely impact the gamer. 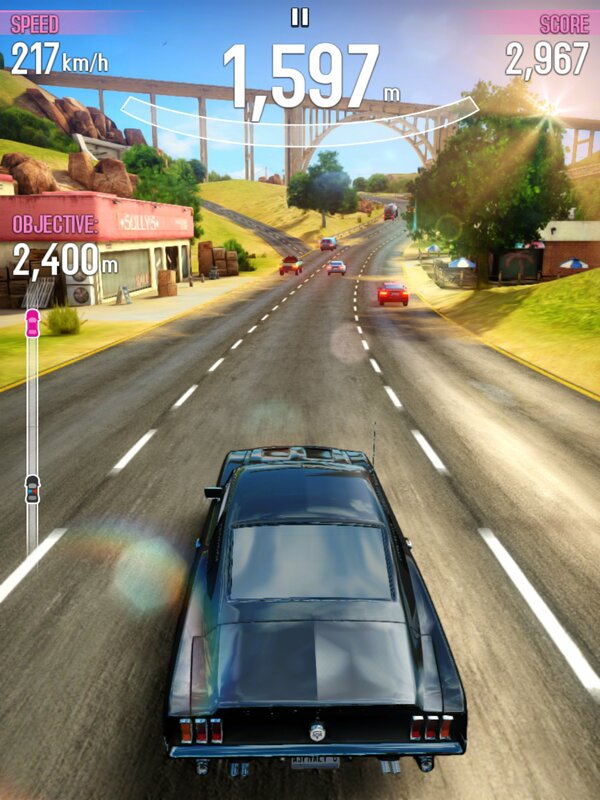 Thus we have Asphalt Overdrive (Free), a lane-based runner take on the venerable Asphalt racing series that’s free-to-play, but definitely pay-to-progress, which is a shame, because it’s good time when it’s not trying to push upgrades or throwing in annoying wait timers. The game is level-based, with missions that generally involve driving a certain amount, maintaining speed and not crashing to keep away the cops, or having to take down a certain number of cars, or hitting a number of stunt ramps. No, it isn’t a racing simulation, but it’s action-packed nonetheless. 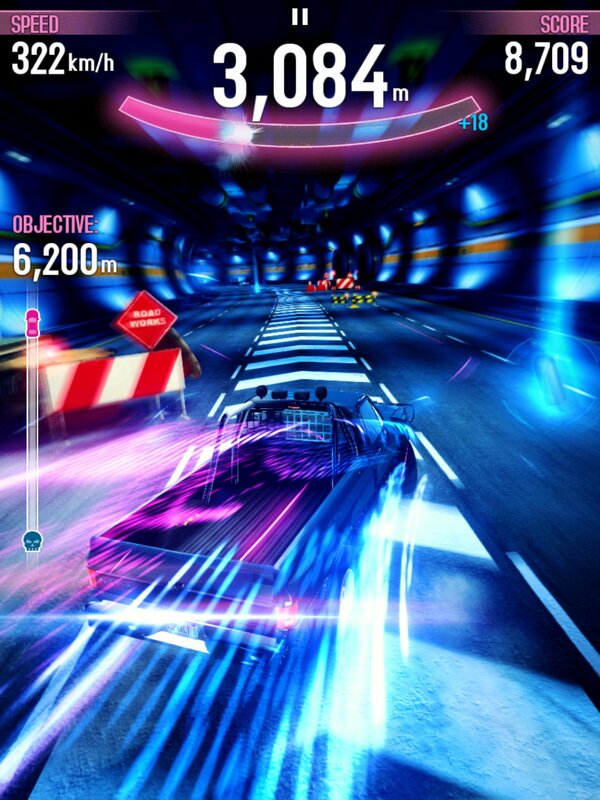 There’s a Crazy Taxi meets Burnout vibe in the score multiplier system which rewards narrow misses and side-swiped takedowns with more turbo and more points. And getting three stars on a level generally requires keeping that multiplier up – though also it requires having a good enough car, as the necessary power level rapidly increases from mission to mission. 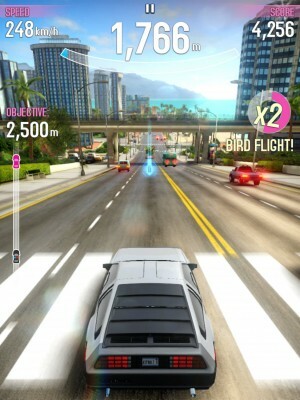 The basic tenets of the gameplay involve just learning how to execute those near-misses by drafting behind cars, then changing lanes and swiping them away, hitting stunt ramps in the right order, and managing turbo (hint: fill the meter up entirely before using it if possible, for the maximum benefit) to maximize the chances of getting three stars. It’s not a really complex game, but it sure makes basic actions seem huge and grandiose, and having a presentation that’s exciting is not a bad thing! Gameloft makes good-looking games, and Asphalt Overdrive is no exception. The 80’s style is colorful in a Miami Vice way, and there’s a certain fuzziness to the visuals that just fits. Plus, the soundtrack is a great fit, and I kind of enjoy the cheesy banter from the co-pilot and from the cops. It’s totally corny, but it’s kinda fun. Surprisingly, all the cars are based off of real-world models. This includes the Delorean DMC-12 which can be won. Yes, you can drive the Delorean. That justifies a lot of this game’s ills. The problem with Asphalt Overdrive is that the game is far too obsessed with monetization. Progressing in the game is not so much through getting more skill, but by getting more upgrades. The game constantly throws hurdles in the way that just require spending money in order to bypass them. A mission where the car is far underclassed really can’t be beaten by being a good driver, it requires being a wealthy one. There’s not much to the core game, learning how to race well enough is not that hard. But succeeding requires cash. And then there’s the energy system that gets in the way too. All I want to do is grind to get a decent acceleration upgrade, and I have to wait to get more energy to play? The wait timers aren’t overly long, but this is a perfect example of a game that has energy timers not because they actually fit the game, but because they can try to make more money. And then better upgrades take time to install? It’s really annoying. I don’t mind free-to-play. I don’t mind games that encourage dedicated players to spend…eventually. But to turn the screws so hard from the word go is just annoying because it constantly stands in the way of having fun with this game. Give the player some concessions, like no energy system, or no wait timers to install upgrades, or maybe slow the curve of difficulty increasing just a bit? All of these systems combined make for a game that’s unfriendly to the point of being opposed to the player, when it could have been so much more fun if turned down the heat a bit. But hey, you can unlock the Delorean, so I suppose there are worse games?